Menlough & Skehana make up the parish of Killoscobe. The parish of Killoscobe was founded in 1306 and Skehana became part of that parish in 1848. It is one of the 56 parishes in the Diocese of Tuam. It is probably better known today as the parish of Menlough. Historically, Menlough was in the kingdom of Ui Maine, later Hy-Many, which was a stronghold of the O’Mannin clan. The ruins of an O’Mannin castle are located in the fields behind the grotto in the centre of the village. The second ruin that is in Garbally is of an O’Kelly castle. It is visible to travellers from Galway to Menlough as they pass through Skehana (half parish of Menlough). Other notable historical monuments include the old IRA monument, erected in the 90s in the centre of the village. It can be seen opposite Jordan’s shop (formally McLoughlins) on Menlough Road. During the Irish War of Independence, a local landlord and large landholder Joyce was shot dead in the parish of Menlough as he walked to Mass. No one was ever apprehended for the crime and the incident forms part of parish folklore. The irony was that the landlord Joyce considered himself more Irish than anyone and was a supporter of the cause and the whole Joyce clan had a history of helping the locals stretching back to before the famine. The ruins of Joyce’s house are still visible in the townland of Corgary as are the fine walls built to protect his lands. A parish with little visible change for many decades has been transformed in the last decade. A large number of new houses built all over the parish are a testament to the growing popularity of this rural location. There is an expanding commuter population living here as is evidenced by a constant stream of commuters passing through this parish in the mornings and evenings. There are four pubs in the parish; two are located in Menlough village, one in the townland of Guilka and one in Skehana. The parish has two National schools. The National schools are in Menlough village and at Garbally (next to the Castle). There were formerly four national schools, but Ballinruane closed in controversial circumstances in the early 2000s. This was one of the few times the parish made national headlines. Corgary also closed during Summer 2013. Students in Corgary have moved to other schools, including Menlough and Garbally. As with most Galway rural villages, parish life tends to revolve around the exploits of its Gaelic football and hurling teams. Menlough GAC has a long, vibrant and proud tradition of participation in the Galway football championship. The club has a number of County Championships to its name at various grades. The tradition is not continuous however. In the 1970s, the football club was denied the county championship, ostensibly for fielding an illegal player in their clear County Final victory. When the county board officials turned down an appeal against the fact that the player had been declared illegal, the decision was opposed in a forceful manner and, allegedly in consequence, the Menlough team was thrown out of the GAA for a couple of years. Football and hurling have been and remain an important focus of life for both young and old. The Football pitch is the focus of many parish activities and is located outside the village on the approaches from Galway City. The facility complete with clubhouse, dressing rooms and stand was developed in the early 1990s. This is the only incident to compete with the Joyce incident for notoriety in parish folklore. Those events led to the foundation of the successful but now nostalgically defunct Doonwood Hammers soccer team. The parish eventually drifted back to its Gaelic football roots after serving out its ban. Hurling is popular in the half parish of Skehana. The Skehana hurling team continue to go from strength to strength and the fearsome phrase Up Skehana well known around Galway has its origins here. The following is a list of priests that have served in the parish of Killoscobe – Menlough church since 1824 and Skehana church since 1848. Here I have researched each priest on the list and have added as much information as I could find about them. Click on the name below to find out more. Not all research has been completed so do drop back from time to time for updates as my research continues. Prior to this point Skehana was in the Parish of Moylough and is still, today, part of the Civil Parish of Moylough which is important to be aware of, should one be doing research. The last CC in the parish of Moylough/Skehana was Fr John J Noone who became PP of the Parish of Killascobe (Menlough and Skehana combined) in 1847. 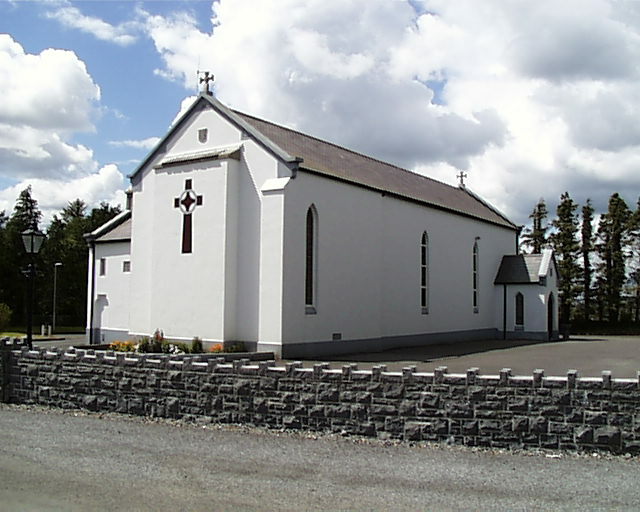 The Costello family, Garbally have served as Sacristans in Skehana Church also for many years even though there has been a few breaks in service. Michael Costello (who was also the area postman for many years) served for 40 years, his son Mark for 5 years and Mark’s brother Mikie served for 36 years until his death in 2001, and then finally Mikie’s son, Gerry, served for 6 years until his resignation in July 2007 giving a total of 87 years of family service. Gerry also served as Church Organist for 29 years from 1978 to 2007. Taken from the Gallery in 1966 before major renovations at that time. Photo: Courtesy Robert Snee – Rework & Enhancements by Gerry Costello Photography. When Skehana Church was built in 1861 the main doorway was at the rear of the church where a window was installed some years ago …….. and just where the gallery stairs now exists. The floor was just soil/clay. Only 2 seats were in the church at the front. Is is believed these are the seats that are now placed at the rear of the gallery. They were reserved for the Fitzgerald-Kenny family who built the church and who were the local landlords. If you stand facing the Altar you will notice an alcove to the left, more or less corresponding to the Sacristy door on the right. 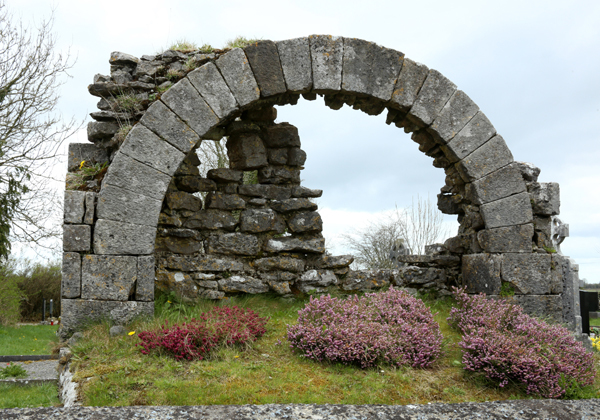 It is believed that this was a door for the use of the Fitzgerald-Kenny family to enter and leave the church. In doing this they would not have to mingle with the ordinary people who were standing behind their seats at the front and who used the door at the rear of the church. A special tomb was constructed for the family just outside that door also and this was accessible via a set of stairs that were under the floorboards just about the location where the Lectern now stands. The cast-iron railed tomb was demolished in the mid 60’s and is now just a tiled slab. Another interesting fact – In my grandfathers time as sacristan, the original Skehana Church bell was taken to Menlough Church and replaced with the bell that was already in Menlough Church. 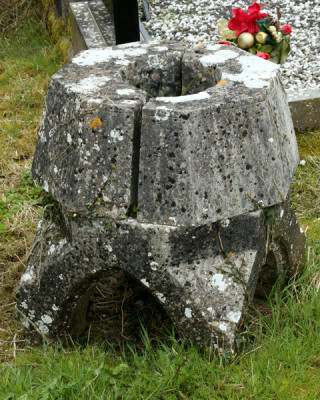 The Skehana bell had a richer tone and the parish priest, Fr Pat Nicholson, decreed that the Parish church should have the “better bell” so the church bells were swapped. My grandfather was furious with such an action and tried to get it back to no avail. My own feeling on this was that we got the better deal as I always felt that the sweeter tone – musically – was in the bell that Skehana inherited while the other bell had a deeper un-tuned tone similar to the old electronic bells that came on the market in the 1970’s and were put into churches all over the country. It is possible that the casting had a fault, an internal crack. 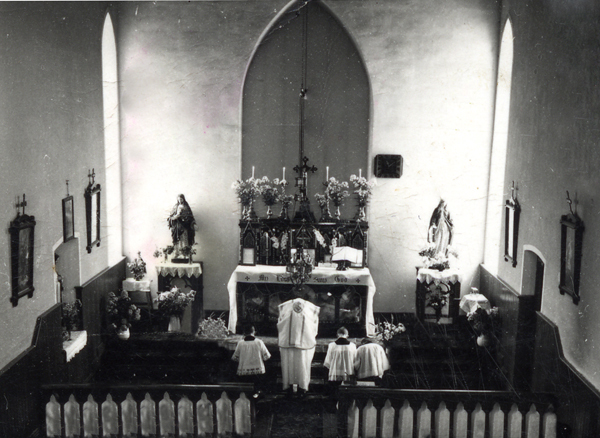 In the 1930’s to the 1960’s most Skehana weddings took place in Menlough Church as it was more fashionable to marry in the main parish church. Looking back on the newspaper archieves it was popular for funerals also to bypass Skehana and be carried out in Menlough Church. I notice that even some went to Moylough Church in those days. 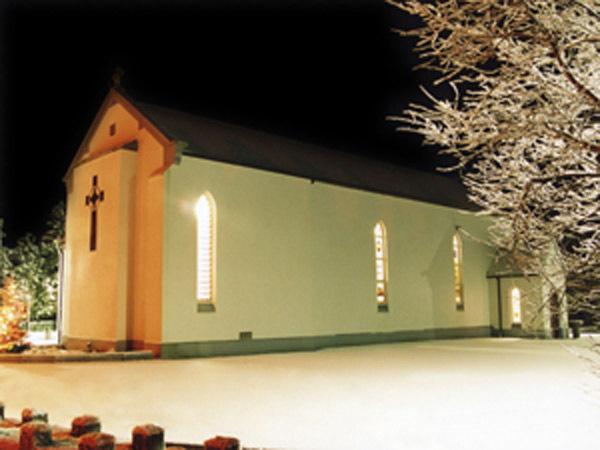 Both Skehana and Menlough Churches had central heating installed in late 1965 for the first time ever. Up until then the churches had no form of heating at all. 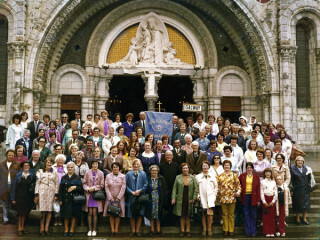 Both churches had their first Sound/PA Systems installed in 1967 by John Byrne from Claremorris. 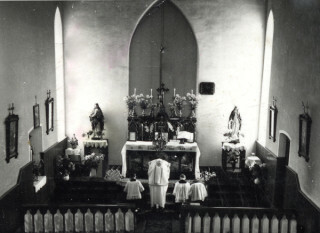 In 1968/69 Skehana church was renovated. The old high altar was replaced with a new marble altar facing the people. The church thinking at this time was minimalist in its sanctuary’s so there was no place for the life size statue of Our Lord laying in his tomb that was contained in the glass surround at the bottom of the old altar. It was practise at this time to destroy or burn objects that were consecrated so one glorious sunny Saturday afternoon, a few people gathered and the large statue, together with a statue from an old crib of a kneeling shepherd that was about 40 inches in height and lay under the gallery stairs along with the six tall brass candlesticks from the old altar were laid to rest in one large “grave” about 3 meters from the Fitzgerald-Kenny resting place in the church yard. In those days, of course, the church had only a narrow drive around. This “grave” now lies under the present car park. Funds were hard come by in those days and much of the renovation work was donated. While I know the list of donors and the items donated I do not plan to list them here. People were asked also to pay half a crown (which was 16 cent in today’s currency) per week from March until September. Nothing was wasted. The contractor that carried out the work was Joe Conroy from Cloonkeen-Abbert and every man in the Skehana half-parish also gave days as labourers as required. One September Sunday afternoon at 3.00pm there was an Auction of old and left-over items. Joe Conroy was the “Auctioneer” for the day and I was given the job as clerk to the Auctioneer. Everything was sold – old floor boards that were taken out were much sought after as half of the church and all of the sanctuary and sacristy had timber floors up until then. A few old doors, some carpet strips, some stands and tables and even the lino that was on the sacristy floor fetched 2 shillings. The one item that was there but was not meant to be sold was the old altar but Joe was not told this and sold it for £5.10.00. Later that evening I dropped the days takings to Fr. Molloy when he came home from Galway and he was most surprised to have actually accumulated £34.15.00 after the day. Asking how it was all accumulated, I gave him the list of items sold and the amount each was sold for. When I pointed out to him that the altar brought in over £5. it was then he remembered that he forgot to tell Joe not to sell the altar. I got 5 shillings for my part which was a great days wages even then.